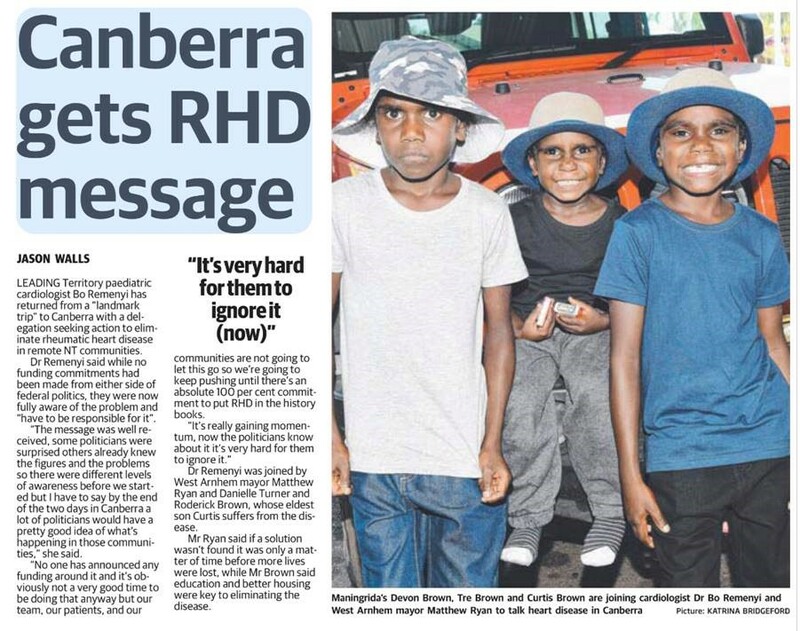 On Tuesday, 23 October 2018, The Snow Foundation and END RHD held a highly-publicised, joint breakfast at Parliament House to raise awareness of rheumatic heart disease and to ask for government support and funding for programs designed to protect communities at high risk. They were joined at the event by join community representatives from Maningrida, NT, health workers, medical experts and the Brown Family, whose three sons have rheumatic heart disease. Please see the multiple stories from media below and you can read more about the END RHD event here. Virtually eliminated from the rest of Australia and most wealthy countries decades ago, rheumatic heart disease remains a scourge in developing countries and remote Aboriginal and Torres Strait Islander Communities in Australia, where rates are among the highest in the world. RHD starts with a sore throat or skin sores but can end with permanent heart damage, open-heart surgery and death at a very young age, but it is entirely preventable. Who is helping to stop it? The event included speeches by Ms Pat Turner AM, Co-Chair of END RHD and CEO of the National Aboriginal Community Controlled Health Organisation (NACCHO), Professor Jonathan Carapetis AM, Co-Chair of END RHD and Director of the Telethon Kids Institute, Hon Ken Wyatt AM, MP, the Minister for Indigenous Health and Hon Warren Snowden MP, Shadow Minister for Indigenous Health, and The Snow Foundation CEO, Georgina Byron. Two panels led by Dr Bo Reményi, paediatric cardiologist and NT Australian of the Year included the Brown Family, Roderick, Danielle, Curtis, Trey and Devon who spoke of the burden of the disease on their family as well as a panel of community members and Aboriginal health professionals from Maningrida, Matthew Ryan, Chelsea Ryan and Charlie Gunabara and Dr Josh Francis, a paediatric infectious diseases specialist from Darwin in the Northern Territory. They spoke of the community-led efforts to end rheumatic heart disease which are helping Maningrida manage the burden of the disease and educate children about the disease and its causes, using traditional languages.